Toshiba Imaging's newest 3CCD prism block color technology and affordable CMOS high definition cameras for broadcast applications will be highlighted at the Polecam Booth #C8013 during the National Association of Broadcasters (NAB) trade show in Las Vegas, NV, April 11-14, 2011. To view Toshiba Imaging's online press kit for NAB, please visit: www.virtualpressoffice.com/kit/ToshibaImagingNAB2011. Toshiba Imaging Systems Division, the global leader in high definition (HD) camera technology for broadcast, scientific, industrial, and defense applications, announces their participation at NAB. The company will be co-exhibiting with Polecam in Booth # C8013, demonstrating their new, high definition cameras, the IK-HD1and the IK-HR1H. Ideal for broadcast applications, Toshiba's IK-HD1 is the smallest, 3CCD remote-head camera available. The tiny head is only 1.6 inches and 2.3 ounces, and delivers the clearest, true color imagery available with 1920 x 1080 output at 30 frames per second. Toshiba's recently introduced IK-HR1H is an affordable CMOS high definition camera with an ultra-small, remote head (only 1.18 in. x 1.37 in. x 1.41 in.) housing. 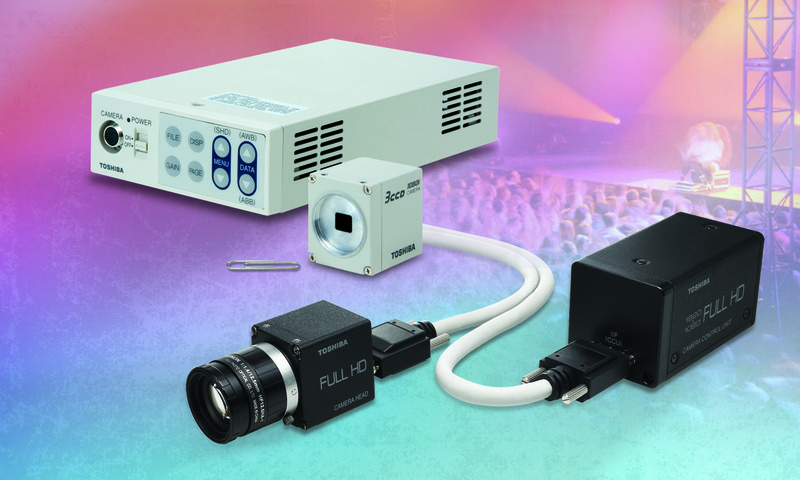 For added flexibility, two versions of this small, lightweight HD camera are available for applications where space is limited. One version, the IK-HR1CD, offers 8-bit (RGB) DVI-I connector and DVI-I with selectable outputs of1080p at 60 fps, 1080i at 30 fps, and 720p at 60 fps. The second small remote-head CMOS model, the IK-HR1CS, features HD-SDI output with 1080i at 30 fps and 720p at 60 fps. Remote-head, high definition cameras from Toshiba Imaging are successfully being used in camera-car rigs to chase storms for Discovery Channels' "Storm Chasers" series, to capture feature film background plates for process playback, to capture 3D imagery, and in many other film, TV, sports, documentary, drama, and internet productions. Toshiba Imaging Systems Division (Irvine, CA) is the premier supplier of high definition (HD) cameras and high resolution 3CCD video color cameras including one-piece, remote-head, and point-of-view cameras for broadcast, entertainment, industrial, scientific, R&D, machine vision, and microscopy. Toshiba's ever-expanding HD camera suite includes both 3-chip CCD and more affordable CMOS sensors.